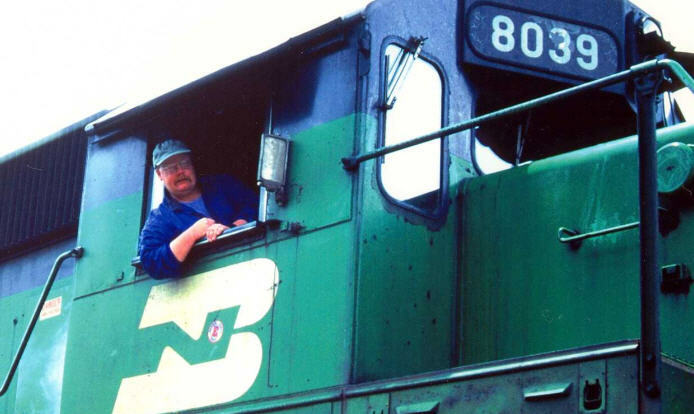 As I wrote in my January 2011 post "Inside The Cab, Part I," I have to admit that, from my very early interest in trains, my goal was to find out what happens in the cab of a locomotive on point. And since my concentrated interest in 1996, it didn't take me long before I was invited inside. Luckily, my interest coincided with the transition of the purchase of Southern Pacific by the Union Pacific. All the engineers, at that time, had great loyalty to the "friendly SP" as opposed to UP. And trust me -- SP was infinitely more friendly than UP. Former SP or retired SP employees will unanimously agree. My first invitation into a cab came when a train was halted in Gold Run and shoved into the eastern siding, waiting for Dispatcher 74 to clear them. Snow was all around. The lead unit was a battered UP SD-60. And I do mean battered. I went home and snatched a plate full of just-out-of-the-oven chocolate chip cookies. Getting out of my car and trudging through about three feet of snow, I yelled up at the cab. The window slided open and I was invited into the cab -- for clear reasons. I met an engineer whom I encountered many times on the road and has invited me into the cab for various rides since -- to the point where I was given the opportunity to operate the controls on a couple of very clandestine runs. Those were, frankly, the times of my doddering life, a few years ago. I think my age also helped: I'm not a kid (far from it) and I am customarily festooned with cameras. Because of my fascination and interest in the locomotive cab and what happens there, I'm on the lookout for interesting videos and photographs. I'll be posting a few photographs of myself in the cabs of locomotives [such as the one of me above, in Burlington Northern #8039, an EMD SD40-2 built in August of 1979 with 3,000-hp, stopped near Switch 9], and other interior shots -- of SD70Ms, SD60Ms, SD40T2s, SD90MACs, C44-9Ws and more. I'm currently on vacation in Ft. Bragg, California as I write this -- and don't have my terabyte external drive with me -- or I could post some of my cab photographs now. In the meantime, please enjoy some YouTube videos of what it's like "inside the cab." What's it like inside an SD60M? Here is a Canadian National recruitment video for conductors. Embedding has been disabled on YouTube by CN's request. It's interesting to note the inclusion of the controversial Belt-Pak, which has eliminated a number of jobs for yard engineers. Nice (and very rare) cab ride in an Amtrak GE P42DC unit, with subject of the video sitting in the co-engineer's seat (not the primary engineer's seat). Because there are actual conductors aboard a passenger train, there are two qualified engineers in an Amtrak cab. The person sitting in what would customarily be the conductor's seat in a freight cab is called the co-engineer.